On a brief inspection, the roundhouse is still intact. You can still tell its original purpose, although the turntable pit location is masked by the parking lot. It's good to see the building retain its appearance and character while remaining useful and functional. Some railfans may not recognize the Colorado Midland Railroad. 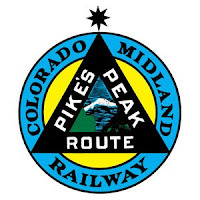 Indeed, it was a major player in the Colorado railroad boom of the 1880s and the Midland Terminal, a remnant, survived until after World War II. A synopsis is available at Wikipedia and a "brief history" is at Richard Stamm's homepage.